We recognize that we are still a relatively new nonprofit with a unique mission. We love answering questions about our operations. See some commonly asked questions below and if we don’t answer a question you’ve been wondering about, please email us at info@topbuttons.org! How are you funded? We obtain funding by community members, grants, corporate sponsorships, fundraising events, and the revenue from our Boutique sales. Why do you sell? We did not start Top Buttons to sell clothing, but it has been a great blessing to our organization and to women of all economic backgrounds in our community as they can both donate and shop while supporting our nonprofit mission. Why did you add new clothing in with the designer thrift? At times it is difficult to outfit a Wearing Confidence Program Recipient in thrift clothing alone. When this is the case, young women are able to take new inventory for free to add to their wardrobe pieces. Additionally, it allows us to offer more options for customers. Are you a faith-based organization? Yes! We are a faith-based charitable and educational nonprofit organization. We believe that real change comes from the inside out through Jesus Christ and this message is incorporated throughout our program services. How do girls qualify to obtain your services? Organizations who serve at risk young women between the ages of 11-25 may enroll with us and receive our Wearing Confidence Program Services free of charge. What type of services and education do you offer? Through our Wearing Confidence Program we provide faith-based, confidence building education and proper fitting attire to more than 300 young women in need each year. Click here to see everything we offer through our Wearing Confidence Program. How do you measure your impact? We measure our impact through evaluations administered to program recipients and also through feedback obtained from the directors of our enrolled organizations. Also we measure impact through the demand for our services, the number of young women who receive our services, the repeat visits we have through mentorship and life skills training opportunities, and the amount of program recipients who obtain jobs after completing our program. What organizations are enrolled with Top Buttons? The Department of Corrections, PACE Center for Girls, Girls Inc., Heartland for Children, The FL Baptist Children’s Home, One More Child, Parker Street Ministries, West Area Adult School, East Area Adult School, Young Lives, Teen Challenge, Boys and Girls Clubs of Lakeland and Mulberry, Echo Ministries, Christ Memorial Youth and many more. Are you consignment? Where do you get your clothes? We are not a consignment store. 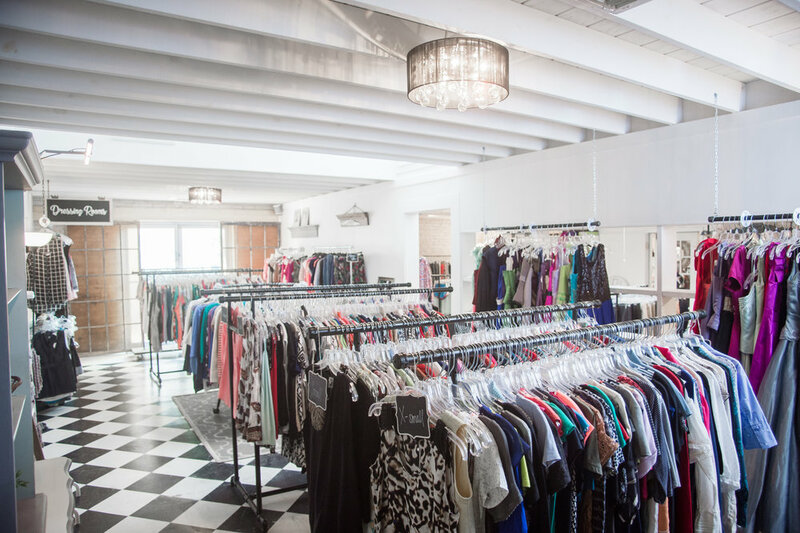 We are an educational and charitable nonprofit with a women’s clothing boutique. We offer NEW AND THRIFT clothing. Individuals in our local community donate thrift clothing to us and a donation receipt is given upon request for tax purposes. How much clothing is given away and how much is sold? Approximately 50% is given away through our program services and 50% is sold. It is important to know that the young women we serve, who obtain free clothing, come back in and bring their families to shop with us. Women from all economic backgrounds come shop with us because we offer new clothing and beautiful designer thrift clothing options for them at inexpensive prices. What type of clothing donations are you looking for? We accept clothing and accessories from pre-teen to adult, maternity and plus-size for women only. How can I donate clothes? You can bring in clothing and accessories any time we are open for public shopping at either one of our boutique locations. They do not have to be on hangers nor do they have to be specific brands. We only ask that the items be clean with no holes or stains. Click here to see our boutique locations and hours of operation. Powers is the Founder and CEO of Top Buttons, Inc. Being a wife, mom of 4 children, and nonprofit director keeps her on the go. She is motivated by her faith in Christ and passion for giving to and serving those in need. Take a look around you: The latest trends are being pulled directly from the runways seen during the 2016 Mercedes-Benz fashion week. These trends filter down into stores, where eventually we piece together looks that fit our personal style. Everyone has his or her own self-expression, and opinion on what’s unique, so for our photo shoot, these girls were asked to wear their favorite street style and pick pieces that really speak to them. When it comes to street style, anything goes. Layer it up, add accessories, or throw in some kicks! We love how adding something as simple as a ball cap can change the whole feel of this look. Throwing on a pair of sunnies can add some much needed edge. Street style can also allow you to feel free and fearless with your personal style. Sometimes we can get utterly consumed with worry over the opinion of others and what people will think of our hair, outfit, etc. Identifying your own personal street style can free you from conventional style, and allow you to embrace something better than before! We would love to hear more about what your street style is. Please let us know in the comments below! To find items similar to the ones shown above check out Justice, Zara, and Aeropostale. Summer is here, HOORAY! Summer is my favorite season for many reasons one of them being fashion, which is so light, beautiful, bright and breezy. For today's post, I would like to share a few summer trends that I am in love with already. Leggings are lighter weight than jeggings. For the summer heat this will work better! Reminder, with jeggings and the thicker fabric, the top doesn't have to cover the bottom. With leggings and thinner material, get a top which covers your bottom. Nothing screams SUMMER louder than bright colors! That is why we suggest that when wearing your black leggings pair them with a bold colorful top! Summer is for work outs. Wear them with your sneakers even if you are not running. Leggings transition nicely from a great workout at the gym to grabbing a quick bite or a smoothie with some of your friends! Summer is for comfort. They are comfortable. We personally love to where them anywhere at any time! Whether you're hanging out around the house or popping over to a friend's house, leggings should be your go to option! Buy them because you can find them for CHEAP! This is another reason we love leggings, they are cheap! Walmart sells them ... for $3. Checkout 2 of our favorite looks below! If you are looking for an effortless summer style, we recommend you pair your leggings with an oversized jersey tee. Looking for something with more of an edge? We suggest you pair your jeggings with a cut off tee layered over a cami. Throw on a stylish fedora to finish off your look! We hope you are just as excited about black leggings as we are! Finding an item to add to your summer wardrobe that can literally be worn over and over is such a dream come true! So, whether you are packing for a vacation or going to a movie make sure black leggings are at the top of your list for things to wear! To find cute affordable black leggings click here! Catherine (right) is wearing her Mom's solid black Tahari blazer. Fighting with kids about what they wear is not a battle many parents want to fight. I admit, it is a difficult battle, especially with the driving force of our culture being profit. But teaching our kids how to dress, along with every other type of education, is very important. A school dress code can be frustrating, most often not because of the rule itself, but because of the inconsistencies with the way it is enforced. However, parents should aim at buying their kids' clothing according to their school's dress code. It is a battle worth fighting. The deeper issue here is not the school dress code, it's allowing our kids to focus on the needs of self rather than the needs of the group. I get it. Reaching a common goal with a group is not easy, and it doesn't take much to distract people from the goal and take huge steps backwards, whether at school, work, or whatever. Our culture places an emphasis on building one's own brand. Serving the needs of self seems to be far more important than serving the needs of the group. Self-expression and developing as an individual is vital, but not when it consistently becomes more important than the love and service of others. There will be a time and place where kids can have more freedom of self-expression than others. Helping them understand this concept is very important in life. While teaching young people the importance of dressing professionally for a job interview, we often address the frustration young people have with denying self-expression with their clothing. Depending on the culture of the company you are interviewing with, often the employer is most interested in your willingness to work on a team, skills and experience. Before a word is even spoken, an employer can get a good idea about who you are simply by how you dress. If we won't teach our children to respect the dress code at school and care about the impact their clothing choices have on the people around them when they are young, they will likely not care about their presentation for a future job interview. There are ways to stay true to self, all the while respecting the boundaries set in place for a common goal to be reached. I tell my children all the time, when you are in charge, you can make the decisions. Until then, respect the boundaries put in place for you and understand it is for the good of our family as a whole. The needs of the group matter too. Professional attire has evolved and especially for women, it doesn't have to be boring to be acceptable. Ironically it's not like dressing our children in adult-like styles is uncommon. Bikinis are available for toddlers. Thongs with "Call Me" are available for our middle schoolers. From our tweens' favorite role models, the music they listen to, and the clothing we buy them, we are training up our children earlier than ever to focus on their bodies rather than who they are and what they have to offer as a whole person. Why is it we seem to quickly buy the most adult styles for our daughters, but putting them into professional attire when it's appropriate is so arduous? I went to Nordstrom, my favorite store most of the time, to look for a blazer for my daughter. (She often comes with me to volunteer at the Top Buttons Boutique and you better believe I have her dress in appropriate yet stylish attire.) Nordstrom had no blazers or structured clothing in her size. One of the reasons I love Nordstrom, is that you can always count on them to have the best customer service and the most current seasonal items available for every family member. 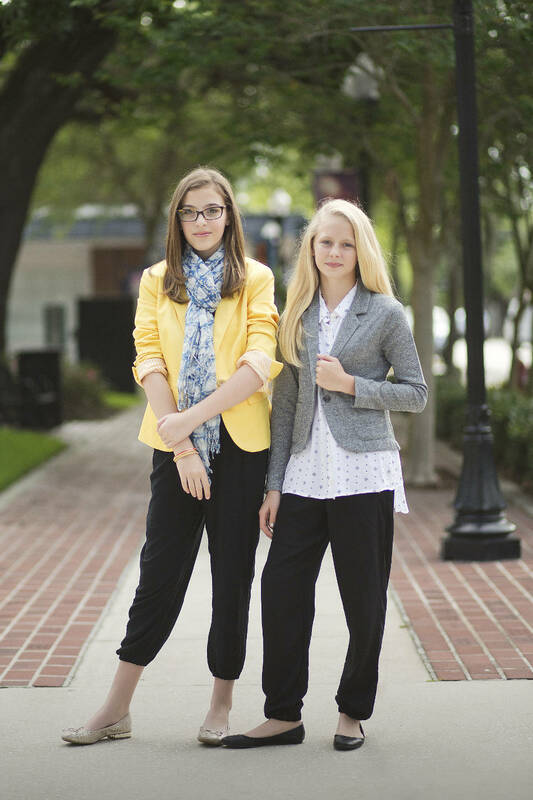 I know going into summer, there are not many moms looking for blazers for their pre-teens. But I still had hope that they would have something along those lines, since I normally do not leave the store disappointed. I even talked to the the kids' department manager about my concerns, who confirmed what I was thinking. They had nothing of the sort for pre-teens. Thankfully, H&M and Gap Kids had some options, and I snagged up a couple of pieces to pull off just the right edgy yet structured professional look for my daughter. It really is easier to find a thong for our pre-teen than it is a blazer. This is a problem. Our daughters are smart, strong, bold, and talented. They are more than just a body. Buying clothing from a young age which places an emphasis on their developing sexuality rather than who they are on the inside reinforces that standing out is connected with their body alone. "If your clothing is overly revealing, you may have difficulty getting attention for your ideas," states Leah Bourne, a contributor for Forbes Magazine. While they are harder to find, a blazer speaks a much more powerful message about who our daughters are from within and what they have to give. Yes, beauty comes from the inside out. Let's keep working on that. But we need to make sure we understand that what we wear affects the way we feel about ourselves internally. The Journal of Experimental Social Psychology conducted a study called "embodied cognition" which revealed that we not only think with our minds, but also with our bodies. Further studies show that clothing directly affects the brain of the wearer depending on two factors: symbolic meaning and the physical experience of wearing the clothing. This is referred to as enclothed cognition. So yes, What clothing is bought and worn by your daughter will affect the way she views herself. This video explains the concept well. Dressing in pajamas at school, will likely result in a more relaxed and less attentive student. That actually makes sense. Putting on all the newest, stylish running gear plus a pair of new Nike shoes, may inspire one to run faster and longer. That makes sense too. What about boho and relaxed clothing in the work place? ... What about seductive and revealing clothing on our daughters? Will it encourage our daughters to behave more provocatively? This is a question we need to ask ourselves. Most parents do want to give their children the resources needed to make healthy choices. Since clothing does impact decision making, we should place a high priority on filling our kid's closets with proper fitting attire. Pull it off with what you have in your closet already, plus one key structured item like a light weight sweater or structured jacket. Contextually appropriate attire, or (contextual modesty) is simply "Clothing which fits the setting its being worn in"
Ask them questions to get them thinking: What message do you want to send with this outfit? Where are you wearing it to? There will be places they can have more style freedom. Give them opportunities to have more freedom in other settings. Support role models who dress creatively but tastefully. Steer clear of those who reinforce self-absorption, provocative behavior, and disrespect. I remember a conversation I had once with a dad about the clothing his daughter was wearing. The story went something like this: Mom and Dad were divorced. Mom always bought the daughter whatever clothing the daughter wanted. She was a tall and beautiful young woman, with the shortest shorts and often very provocative attire. Dad took out his frustration on his daughter, often griping and complaining about what she wore. I offered a potential solution for Dad to take his daughter shopping with the only condition being that Dad will only buy it if he likes it. Knowing that Dad sees the problem and is offering a solution rather than just complaining is a step in the right direction. You may be fighting a battle you feel like you are losing. But as a parent of a beautiful, tall pre-teen daughter myself, I can say that teaching them the importance of sending the right messages with their clothing is important enough to sometimes fight about. If we don't educate and equip our daughters on how to present their best self on the job, at school and in life, the fashion and media industry will. And we may not like the outcome. I would recommend we start by finding them a blazer. Makeup was done by the one and only, Yolanda Delacerda. We love you! A huge thank you to Beth Carter for jumping in as photographer. She photographed our very first Top Buttons photoshoot back in 2012 and has been such an encouragement ever since. Her work is exceptional and she captured the essence of what I was looking for with this article, perfectly. Boyfriend jeans are the perfect way to transition from winter to spring, and from spring to summer. 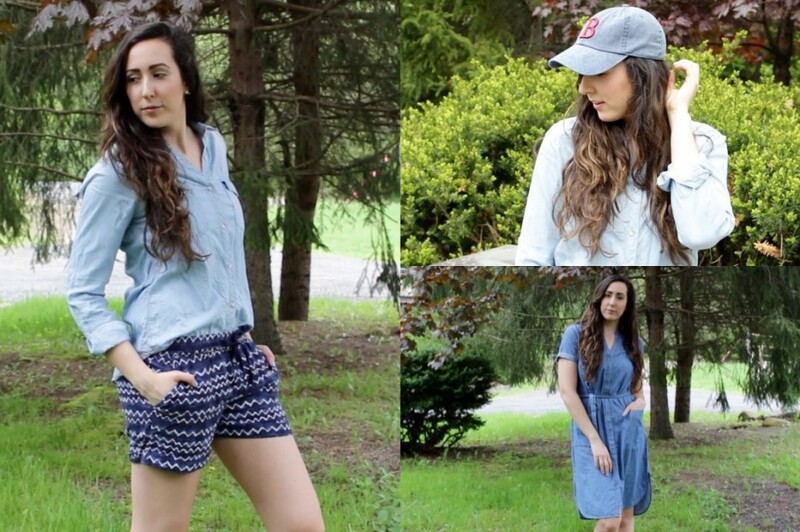 Check out the video below, where we share some creative looks that use this versatile garment! Oh yes girls it is that time of year again! Go ahead and break out your favorite pair of shorts and get ready for beach days, patio lunches, or weekend trips to the farmers market. Some popular trends we are seeing for spring are floral prints, denim, and scalloped edge shorts. Check out a few of our favorites from these trends! Floral prints are all the rage this spring. A bold floral print short paired with a contrasting top is a great way to spice up your look! Every girl needs a pair of shorts in her collection that stands out from the rest. A great short to fill that spot is the scalloped edge short. Try pairing these shorts with a chambray top and a matching bag as seen here! Looking for an easy outfit? You can never go wrong with a great pair of denim shorts. Pair them with a comfy tee and some converse and you are all set. We hope you are just as excited as we are about spring trends! To find floral print, scalloped edge, and denim shorts check out these great stores! Let us know which trend is your favorite in the comments below! Winter is upon us and it is wreaking havoc on our skin. Today we are going to share with you our favorite skin care tips to help you survive this winter season. 1. Moisturize with natural oils. Our skin gets extra dry in the winter so we need to hydrate it with the good stuff. Using natural oils gives it double the moister and vitamins and healing properties as well. Some of our favorites are Rose hip oil, Coconut oil and vitamin E oil just to name a few. Drinking water is something we should all be doing more of. In the cold dry bitter winter (depending on where you live) we know it can be hard to drink ice water but our skin NEEDS it. Drinking at least a liter of water a day and add in some tea of your choice and your skin is well on its way to glowing again. Humidifiers save noses and throats especially when you have a cold, but did you know they are also great for your beauty regimen? They help along in the moisturizing of your skin. It is recommended by beauty experts to start using a humidifier in your room to help you towards glowing skin. Our skin needs some extra pampering in the winter months and the best way to do that is with a moisturizing face mask. Here are some of our favorite DIY moisturizing face mask recipes. . Ingredients: ½ Avocado ½ very ripe banana 1 tbsp. Olive or coconut oil Mix and mash everything together then apply to clean skin. (Careful its messy) Leave on for 10 to 15 minutes. Pat off with a damp towel and follow up with a moisturizer to really lock in the moisture. If you are looking for a deep clean moister face mask then try this: Ingredients: ¼ avocado mashed 1 slice of a lemon 1 tbsp. of honey 1tsp. of olive or coconut oil Mix together and apply to clean face. Leave on for 10 to 15 minutes and was off with damp cloth or warm water. These are some of our favorite ways to take care of our skin in this dry season. We hope this post inspires you to take some time for yourself and be pampered. Every girl needs a functional closet full of quality staples that will outlast trends and serve as the building blocks for her wardrobe. A key item at the top of our list to invest in is a trench coat. This jacket has been worn throughout the decades by style icons such as Jackie O., Audrey Hepburn, and the list goes on. A trench coat stands the test of time and will always make you look chic. We promise! In your search for the perfect trench, try opting for a neutral one. A classic trench in khaki, black, or navy will go with anything. We love this mid-length one. We always suggest investing in pieces that will serve you well. Items that can easily be mixed and matched within the contents of your closet. Once you have that in place it's always fun to branch out and add in colorful pieces like this purple trench. Pulling off a leather jacket can seem intimidating, so intimidating that you wouldn't dare purchase one let alone have it hang in your closet. There seems to be this unspoken type of girl who can easily wear a leather jacket. You know, the girl with edge or the girl who is always on trend with everything she puts on. We are here to tell you that you don't have to fit that stereotype to embrace leather. We encourage you to throw caution to the wind because no matter what your style is everyone can safely pull off leather and do it with confidence! Check out the two looks below for ideas on how you can make your own statement with leather. Layer a leather jacket over a loose fitting sweater, add riding boots for a serious winter vibe, and finish your look with a cute necklace. For a softer look, opt for a light colored leather jacket. Black and cream is always chic. 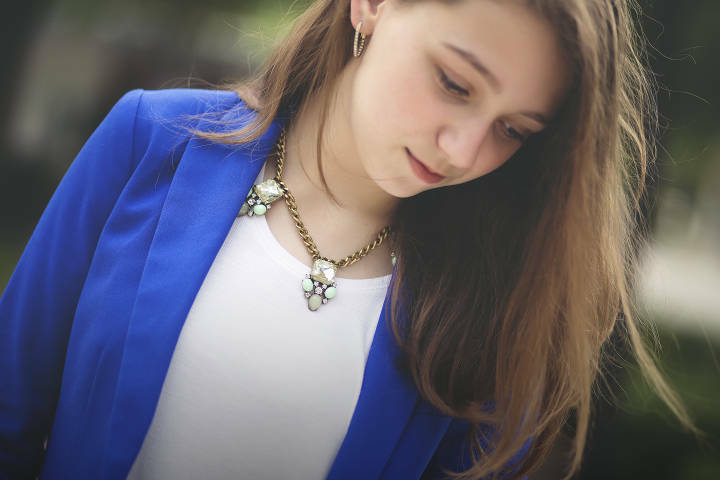 Throw in a bold statement necklace and your look is complete. Check out Forever 21 and A&F for stylish, affordable leather jackets. We hope you enjoy finding your unique edge with leather! Finding the perfect winter coat can be a bit daunting. You want a jacket that is warm and durable, yet speaks to your personality. After all you're going to be wearing it every day for a few months. If you're wanting to branch out and forsake the land of black and grey jackets, why not opt for a color? Pastels are a huge trend right now so there are plenty of options available in stores and on-line. Add a little pop of color to your outfits with a coat like this pink one. You'll definitely stand out in the endless sea of black coats. How cute is the bow detail in the back? Keeping in mind that the Christmas season is all about giving and receiving, we've put together a 2015 Holiday Gift Guide that features a variety of items all priced at $25 and under. Not only are they affordable, but these items are essential to every woman's life. An added bonus, is that each of these items is small enough to fit into a stocking too! So whether you're looking for ideas of what to put on your own wishlist or you're on the hunt for the perfect present for a friend or family member, you can't go wrong with these suggestions. I mean, who doesn't love a good mug?! Nowadays there are so many to choose from. Some feature inspirational quotes, while others are printed with cute graphics. Some are made for hot drinks on-the-go, while others are made to be sipped from home. With a little perusing, you'll be sure to find one that perfectly fits your personality. A journal for the journey. Everyone is on a journey in life, and us women usually like to document it! From diary entries to letters to notes and more, journals are so handy -- so why not make it cute? Barnes & Noble has the absolute best selection of journals around, including this set of Vintage Blossom ones. Urban Outfitters has a selection of stationary as well, and this Feather Notebook is a favorite! The best thing about candles is that it's like the gift that keeps on giving! Seriously, it can change the mood and atmosphere of a whole room, over and over and over again ... until it burns out, of course. On the other hand, Bath & Body Works is the go-to for all things scent-related. From body wash, to lotion, to candles, they have it all -- both in quantity AND quality. The Vanilla Bean Noel candle is timeless. While it is fitting for the holidays, it is one of those scents that never gets old. Lotion -- it's a triple threat that helps you smell good, look good, and feel good. It helps alleviate dry, rough, and itchy skin, so say goodbye to those days and hello to an array of scented lotions. As mentioned before, Bath & Body Works is the ideal place to shop for scents, and this Warm Vanilla Sugar gift set includes lotion, body wash, and hand sanitizer for a great value. Ulta, on the other hand, is the prime place for all cosmetic-related shopping. Their OPI Body Lotion set comes with 6 different scents. This set will accommodate anyone, whether they just want to switch scents daily, or try a bunch out until they find the one they love best. The secret to buying wallets: purchase a wallet that's cheap enough, so that once you've bought it you'll still have money left over to keep in it. That's why we searched for two versatile and affordable wallet options from Charming Charlie & Forever 21. These wallets are available in neutral colors, so that they can match with any purse. Big necklaces and graphic-faced watches are so in this year. Why spend loads of money on ever-changing accessory trends? Wal-Mart can help you make a statement with a necklace like this bold Pearl Cluster one. They have a great selection of statement necklaces ranging from $5-$15. You'll be sure to find an accessory as unique as you or a friend. Charlotte Russe and Rue 21 both have an assortment of watches, each one featuring a different face. This Flower Garden watch is just $7! By searching "watch" in their search-bar, you'll find a large variety ranging from quotes, to patterns, to pictures and more! After reading our Holiday Gift Guide, we hope you've been inspired for both wish-list making and gift-giving! Lace is a timeless style that can be tricky to wear because it is often times sheer. It is especially difficult to add lace pieces to fall looks. However, with a few extra layers, summer oriented lace pieces can be layered, making them perfect for the chillier days ahead. Lace in darker tones rather than white are perfect for fall. This olive green color is a perfect example. Here the lace is built into the dress and laid over the main construction providing a loose fit. Dresses like this allow the sheer lace to shine without showing skin. To balance out feminine lace details, add solid knits and black tights. Another way to wear lace is to wear it over a solid top. Here a white summer lace top was converted into a fall look with a burnt orange scarf, hat and cup of coffee to keep warm and cozy. This top has extra volume and a long hem, I suggest pairing these types of silhouettes with a slim fitting pant. Do you have a few lace pieces in your closet ready to take on fall? Let us know in the comments below. For many, the holidays can be an extremely busy time of year. There are gifts to be bought, holiday parties to attend, and potential travel to prepare for. In the midst of all of the hustle and bustle it can be difficult to find time to plan what to wear for all of the special events of the season. Luckily, we have a few ideas for you! We know you don't have time to go out searching for the perfect outfit so we found it for you. This striped dress and faux fur vest combination is perfection. It has just the right mix of dressy and casual. This basic t-shirt dress is easily dressed up with a vest, tights, and accessories. The layered necklaces and watch give the outfit personality and the ankle boots are right on trend. No outfit is complete without the right makeup. Neutral eyes and a berry lip pull everything together. Not to mention the festive red coordinating polish. We hope you are inspired and feel confident in putting a fabulous holiday outfit together! "Giving Tuesday" is coming up quickly on Tuesday, December 1st. It's an international day of giving back, and we knew you would be interested in an opportunity to provide greatly needed clothing to some very deserving young women! Would you consider sponsoring one at-risk young woman at $100 to receive our unique Top Buttons Wearing Confidence Program? Through our program, these young women receive confidence boosting educational sessions, new wardrobes of proper fitting clothing, and much more. Did you know we provide our Wearing Confidence Program to the young ladies of PACE Center for Girls, Porch Light, Heartland for Children, Youth Villa, the Dream Center, Girls Inc, and More? "PACE Center for Girls, Polk has had the privilege of a partnership with the amazing Top Buttons organization. The collaboration between the two non-profit programs, has benefited the PACE girls in a myriad of ways. Every month, several of our girls are able to participate in the Top Buttons Wearing Confidence Program at the Top Buttons Boutique. There they learn many necessary skills while having a good time with the wonderful staff. The Top Buttons team teaches girls how to dress appropriately for a variety of occasions, while maintaining their own sense of style. Girls have the opportunity to try on an assortment of clothing and accessories through which they take new wardrobes of quality clothing for free. This exercise allows girls to have a hands-on experience while receiving input from the staff. As part of the program, professionals teach girls how to apply make-up and style their hair in a trendy but appropriate manner. The Top Buttons staff also comes to the PACE Center to educate our girls about topics surrounding self-esteem and positive body image. These experiences have meant a great deal to the PACE girls. Through a meaningful approach, they are receiving valuable guidance. Girls return to school after visiting the program elated and with increased self-esteem. They also share what they have learned with their peers. Girls within the PACE program, are now working diligently to earn the privilege of this experience. It is something they all strive to be a part of. A big "Believing in Girls" thank you to the Top Buttons non-profit organization for your investment in the girls at PACE Center for Girls, Polk!" Top Buttons Wearing Confidence Program Recipients with their personal stylist in the pictures featured below. "How to Dress for Job Interviews & the Workplace" "Feeling Confident from the Inside Out" "Understanding the Impact of Culture on Clothing Choices" "Importance of Contextual Modesty" ...AND we don't just educate these young women, we provide them with the clothing resources and tools they need to present their BEST self in every day life. Give $100 to sponsor one girl today (click here) or keep us in mind for #GIVINGTUESDAY. We are asking every person reading this post to sponsor 1 at-risk girl at $100. Or do what you can, every penny counts! This year, we have had over 200 at-risk girls participate in our Wearing Confidence Program and we hope to double that number in 2016. Through this #GivingTuesday Campaign, we hope to partner with over 200 people to fund our Wearing Confidence Program through May of 2016. Thank you for your time and support. Please share this post with anyone who you feel would also be interested in what we are doing at Top Buttons. Have you spent hours sifting through your closet trying to find the perfect outfit to wear? Or have you been faced with the challenge of which pair of shoes to build your outfit around? Well, you are not alone! Fall is the perfect time of year to explore your creative side and try something new. Sit back and check out how to wear the stacked bootie, the ankle boot, and the riding boot. Feeling bold? Try stepping out in a pair of stacked booties! We love the feminine touch these boots bring to most outfits. Try pairing your booties with a pair of tights as seen here. The key to properly wearing the ankle boot is all in the way you style the jean they are paired with. One of our top picks is the double cuff. This approach elongates the leg and shows off the shoes! What girl doesn't love a pair of good riding boots! This boot can be paired with a variety of fall looks. Heading out to dinner with the girls? Throw on your skinny jeans with a long cardigan and finish off your look with a pair of riding boots. We hope you found just what you were looking for with all your shoe needs! To find similar boots we encourage you to check out Zappos.